The timing of the result that has ended any realistic prospects of making the play-offs and the news that the club is set for a groundshare next season marks the start of what is sure to be a long and heady summer. This away trip to Sunderland was set to be the highlight of the season, something that many were looking forward to on their way back from Wembley last May, now, it feels something of a sideshow to the club’s parlous immediate future. Focusing back on the football, Sunday’s goalless draw with Bristol Rovers came at the cost of Tom Bayliss and David Meyler sustaining what appear to be season-ending injuries. Bayliss is undoubtedly the bigger loss of the two – and in light of this week’s news, could well have played his last game for the club – but the double injury blow leaves us looking light on experience and quality in the centre of the park ahead of one of our toughest away games of the season. Zain Westbrooke and Jordan Shipley are the prime candidates to come into the side alongside Liam Kelly, although an ambitious option could be to start Bright Enobakhare in Bayliss’ deeper role and bring Conor Chaplin into the side as a strike partner for Amadou Bakayoko. Given what we know about Mark Robins, and with Westbrooke ear-marked as Bayliss’ long-term replacement, the former Brentford youngster seems the most likely to get the nod. Elsewhere, there doesn’t really seem much need or scope to change things up. Last week raised the question whether Amadou Bakayoko is an ideal first-choice centre-forward, but that is probably something to be looked at over the summer rather than the remainder of the season. Our previous meeting with Sunderland is probably best remembered for the glaring one-on-one miss from Conor Chaplin late-on that could have secured an impressive come-from-behind victory. In a stop-start game due to injuries sustained by both teams, an early second-half goal from Lee Cattermole, of all people, looked set to edge Sunderland and their large away following to victory. However, the brightest moment of Dujon Sterling’s early months at Coventry City saw the Chelsea youngster pounce on a defensive error to tee Jonson Clarke-Harris up to earn a share of the points. It was a big rebuilding job for Sunderland this season, but with comfortably the highest budget in the division and with a squad boasting a few leftovers from the club’s recent spell in the Premier League, Sunderland were expected to walk this division. Nonetheless, in getting the club into an automatic promotion place with six games remaining, Sunderland manager Jack Ross is currently on course for par. To Ross’ credit, Sunderland have been incredibly resilient this season, losing just two games and having by far the best record in the division in recovering points from losing positions. Going against him is the sense that he hasn’t quite gotten the best out of the squad and resources at his disposal, as evidenced by the amount of times Sunderland have started games sloppily and have had to rescue points. Sunderland’s season can be broken down into two periods in which two different players have been their chief goal threat. The first half of the campaign was academy youngster Josh Maja’s, while the experienced winger Aiden McGeady has taken the reins since Maja’s departure for Bordeaux in January. In a Sunderland side that want to dominate possession but are perhaps not quite penetrative enough in possession to break through opposing defences McGeady’s ability to glide past defenders and score spectacular goals has tipped tight games in his side’s favour. In Chris Maguire, Lynden Gooch and Lewis Morgan, Sunderland have an array of talented individuals that can win games through moments of supreme skill in addition to McGeady, but the former Celtic man is clearly the man in form. 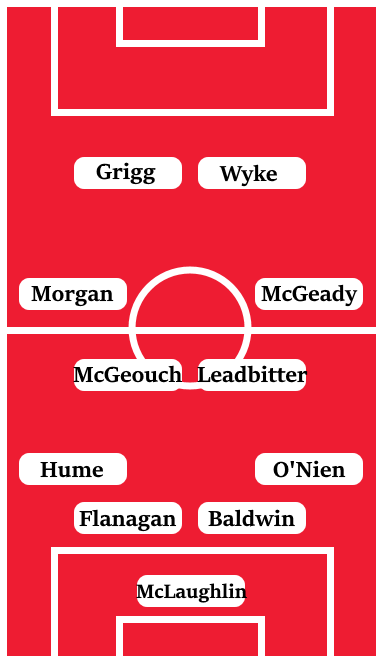 Although the lack of form from penalty-area striker and big January signing, Will Grigg, is threatening to become a mark against Jack Ross’ style of football, the move in recent weeks towards a 4-4-2 with the target-man Charlie Wyke playing alongside Grigg looks to have given Sunderland a greater attacking presence and directness to their game. Both of Sunderland’s front-men are proven goalscorers at League One level and could well come into form in this game. In central midfield, Jack Ross is blessed with the experience and quality of Grant Leadbitter – whose set-pieces since re-joining the club in January have further added to Sunderland’s attacking threat – and Lee Cattermole, while in the dynamic Max Power, the homegrown talent of George Honeyman and the ball-playing Dylan McGeouch, Ross has different options and partnerships to utilise based on the opposition and conditions of the game. Although Sunderland have one of the more fearsome goalkeepers in the division in Jon McLaughlin, a sloppiness in defence has been an issue for the Black Cats this season. In an area of the side Jack Ross has been able to make the biggest changes, only the former Peterborough United man Jack Baldwin has convinced on a consistent basis. That defensive fragility – although, it’s worth point out that Sunderland have one of the best defensive records in the division – is partially the result of Sunderland’s commitment to dominating games and penning opponents back in their own-half, inevitably opening themselves up to defensive mistake from pushing high up the pitch or in playing out from the back. The strategy for this game from Mark Robins should clearly be based around isolating Sunderland’s centre-backs and utilising our pace on the counter-attack.